soul projected on canvas, callused by time. sorrow bleeds... the heart sleeps." A. Bernardo C. Marigmen III is an artist/director with a diverse background in the fine arts and architecture. He received a BFA in 1991 and a MFA in 1993 from The School of the Art Institute of Chicago. Marigmen also studied architecture at the Milwaukee School of Engineering, attended University of London in their design programs and taught art history at the illustrious Louvre in Paris. In 1999 he showcased & curated over 50 exhibits in the USA. He is also active in promoting the fine arts to children; especially in his hometown of Waukegan, IL. He assumed the role as Director of Art Etcetera (a local nonprofit arts awareness group) after its founder, Jim Harrington, passed away in 2000. In this position, he has proven himself to be a driving force in the art community and has helped establish some of the city’s premier arts-related activities including the annual Dandelion Wine Fine Arts Festivals and the monthly ArtWauk where he promoted a diverse group of artists at Bernardo Marigmen Gallery in the historic Genesee Theatre. Marigmen is the 2005 recipient of the prestigious Jack Benny Arts & Humanities Award. In 2004, he was inducted to the Filipino-American Hall of Fame for his achievements in the Visual Arts. In 2002, he received Friends Of The Arts – Service to the Art Community Award. He has been featured in Artbeat and Artscope, as well as different publications such as MR Magazine, Abitare, and DNR. Since 1987, he has produced over 1,000 original pieces of art and has exhibited at close to 200 galleries including several venues abroad. 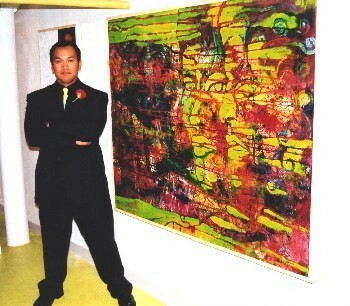 Currently, Marigmen is Vice President/Partner of Tovoli Neckwear where he designs, paints and manufactures original & limited edition wearable art for exclusive clientele such as the Museum of Contemporary Art, Milwaukee Art Museum, Elmhurst Art Museum, Fred Hayman’s of Beverly Hills, and Marshall Fields. His custom ties have been featured in popular television programs like Wheel of Fortune, 3rd Rock from the Sun, Day & Date, and Geraldo Rivera Show. His art have also been part of stage/set scenes for films like Little Heroes and Chicago’s production Cheap Show. All works represented on this page and throughout this site are copyrighted by Bernardo Marigmen. No images may be reproduced, downloaded, or electronically manipulated without the expressed written permission of the artist.